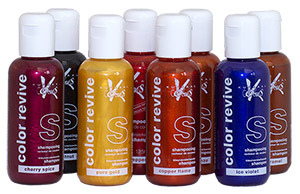 Use Color Revive to maintain vibrancy, shine and condition between permanent dye applications. Permanent colour will fade and become dull over time due to U.V. light, harsh shampoos and chlorine in swimming pools. The use of the Color Revive Shampoo followed by the corresponding Color Revive CrÃ¨me conditioner will guarantee an optimal colour and care result refreshing your permanent colour. The colours can be mixed so you may even like to make your own tailor-made blend of colour to suit your needs. Blondes, redheads and brunettes - whatever your shade - rejuvinate your colour! Color Revive is highly charged with temporary dyes and ultra-shiny particles of pearlized mica. The shampoos contain a U.V. filter to protect the dyes and the hair from UV- induced fading. The conditioners contain a mix of active ingredients including wheat protein and ceramides leaving your hair feeling soft and shiny. Neither the shampoo nor the conditioner contain ammonia, oxidizing agents, parabens, sulphates or alcohol and both are compatible with all hair dyes. Balancing shampoo is used to strip out build up of product and thoroughly cleanses hair in preperation for the use of Color Revive colour shampoos. Balancing conditioner seals in and maintains colour. It protects colour, infuses shine, builds body and resists humidity. Can be used alone, in addition to or alternately with Color Revive conditioners. Hair colouring products for use on natural or permanently coloured hair.